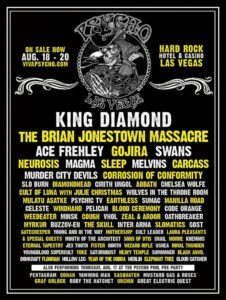 There were many reasons to lose our minds over Psycho Las Vegas 2017, mainly the range of musical genres represented from doom to sludge to black metal to wtf was that?! Reasons such as the “whatever happens in Vegas…” level partying with bands all night, betting our wages between sets, experiencing live music with various body parts submerged in the pool, and resting our asses amid performances in The Joint. The flashy Hard Rock Hotel, adorned with music memorabilia and infested with patched and tatted longhairs, was the setting for this extended psychedelic weekend. A coincidental upgrade to PLV 2017 from the prior year was the recent legalization of recreational marijuana in Las Vegas. Although, this did not necessarily make imbibing any more convenient. Smoking indoors was not permitted, nor were we allowed to casually bring it in any form into concert venues per the tight security. 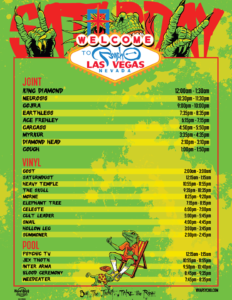 Either way, it was only natural to want to indulge at this stoner fest in the adult wonderland that is Sin City. Atop of the stage in the center of the crowded floorboards of Vinyl, Hollow Leg set the tone to get down & drink it down with raspy, sweeping vocals and gritty, yet incredibly groovy guitar. The UK’s Elephant Tree’s soft, echo-y male vocals layered over slow, heavy riffs painted a melancholy mood. Mykur was the “black metal” solo project from Denmark. Amalie Brunn’s ethereal vocals layered with folkish, downtrodden and sometimes foreboding elements recreated the dread of being lost in a haunted forest. Carcass of Liverpool, were the perfect antidote of lyrical gore and technical artistry. It was impressive to see this band who originated over thirty years ago more aggressive and relevant than ever. They performed their choice cut Incarnated Solvent Abuse, along with several hits from Heartwork and their highly rated Surgical Steel album. King Diamond, more like a dark opera production than simply a horror metal band, did not fail to entrance the audience despite a few minor hiccups with the sound system. Jodi Cachia performed wicked choreography dressed as the possessed Miriam and grandma. The inverted crosses, curved staircase and baby coffin props created a visual feast which fueled the intensity of the music. Considering all the familiar Austin faces at Psycho LV 2017, most of you have already gambled that the lost wages were well spent. This entry was posted in Uncategorized and tagged Alia O'Brien, Amalie Brunn, Blood Ceremony, Carcass, Elephant Tree, Hollow Leg, King Diamond, Las Vegas, Mykur, Psycho Las Vegas, Sin City. Bookmark the permalink.